Windows 10 will cease to be a free update on 29 July 2016, exactly a year after its initial release to the general public. There are plenty of reasons to embrace Windows 10, not least the fact it is a free upgrade to users of Windows 7 and 8.1 and at present over 200 million devices run Windows 10, but there are a few things to consider if you're using older hardware and software. You will need to check with your software provider whether your applications are compatible with Windows 10, you don’t want to upgrade to suddenly find that you can’t do your normal work on your PC. We recommend that you use an IT professional such as QuickTec to do your upgrade for your business PCs. If you do upgrade to Windows 10 and then decide that you don’t like it, you can go back to your old system. However if you run in to trouble you may lose some of your data, so make sure that you have done a full back up before starting the upgrade and that you have done all of your updates on your current Windows 7 or 8.1. 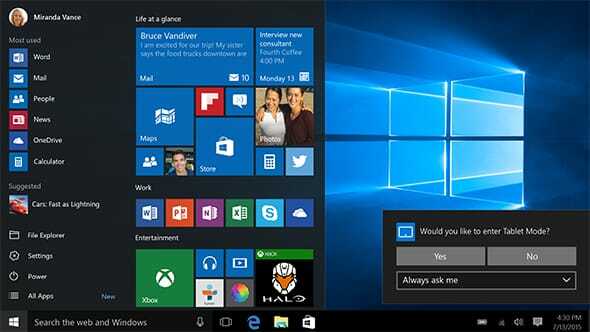 With many new features and system improvements, upgrading to Windows 10 will give you a much more user friendly interface than Windows 8.1, a virtual assistant called Cortana which allows you to control certain elements of your PC using your voice, you no longer need to have a Microsoft account to log in as was previously required with Windows 8.1 and the option to split your screen into half or even four quarters of the desktop. Windows 10 operating system is easy to understand, has new helpful features you will want to use and is familiar like it was on Windows 7.